What do James Bond and Lipitor have in common? Why do traffic jams appear out of nowhere on highways? What can we learn about innovation from a glass of water? In Loonshots, physicist and entrepreneur Safi Bahcall reveals a surprising new way of thinking about the mysteries of group behaviour and the challenges of nurturing radical breakthroughs. Drawing on the science of phase transitions, Bahcall shows why teams, companies, or any group with a mission will suddenly change from embracing wild new ideas to rigidly rejecting them, just as flowing water will suddenly change into brittle ice. Oceans of print have been written about culture. Loonshots identifies the small shifts in structure that control this transition, the same way that temperature controls the change from water to ice. Using examples that range from the spread of fires in forests to the hunt for terrorists online, and stories of thieves and geniuses and kings, Bahcall shows how this new kind of science helps us understand the fate of companies and empires. Loonshots distills these insights into lessons for creatives, entrepreneurs, and visionaries everywhere. Over the past decade, researchers have been applying the tools and techniques of phase transitions to understand how birds flock, fish swim, brains work, people vote, criminals behave, ideas spread, diseases erupt, and ecosystems collapse. If twentieth-century science was shaped by the search for fundamental laws, like quantum mechanics and gravity, the twenty-first will be shaped by this new kind of science. 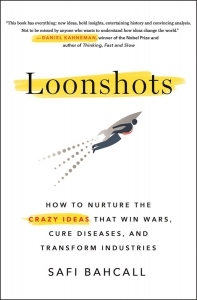 Loonshots is the first to apply this science to help all of us unlock our potential to create and nurture the crazy ideas that change the world.